E-chords is the best site for you to find guitar chord, guitar tab and many other tabs and chords for different instruments. Browse our site and discover how it can be a tool for you to learn how to play a instrument quickly and easily . 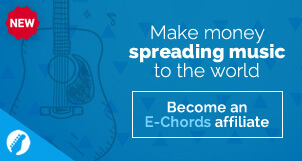 E-chords has powerful tools that help you to learn music. We also have a lot of tutorials made by reviewers. If you want an extra help, you can become a premium member, and have access to premium video lessons and exclusive contents and gifts.